Happy weekend, everyone. Since the article will be long, I’ll start with my skin type. I have combination, sensitive skin prone to breakouts with light couperose veins. At the same time, it’s where hot and dry where I live so I want extra hydration and anti-aging. It’s hard to find anti-aging products that won’t make the skin oily and won’t cause inflammation. This line by Korean brand Purito is unique in the way that it has this effect. Usually, the products in 1st, 2nd and 3rd steps of a skincare line are similar in ingredients. In this line, they are united by centella asiatica. This plant has an antiseptic, anti inflammatory, soothing properties. 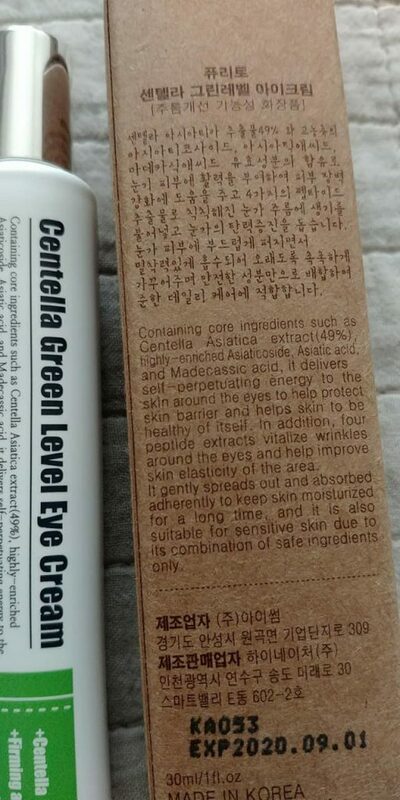 Centella increases collagen synthesis preventing aging. I like cleansing discs for light daily exfoliation. It’s not the first BHA product that I’ve used. And I must say that it does its job excellently. The package has 70 patches. Textured on one side and smooth on the other. After cleansing with a foaming cleanser, I wipe the face with the texture side, then with the smooth side. What’s unusual about these discs is that they don’t leave a dry feeling on the skin. Having BHA in the ingredients, the discs do not dry the skin, centella and hyaluronic acid plus panthenol balance out the acids. I have described centella properties above. It contains asiaticoside, asiatic acid, madecassoside and madecassic acid. 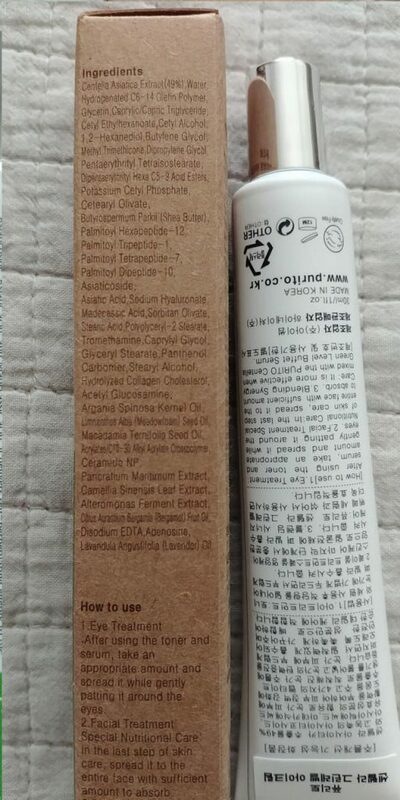 Which soothe, relieve skin irritation, have anti-aging effect, promote regeneration and healing, collagen synthesis, act as anti-cellulite, anti-swelling and anti-inflammatory agents. Hyaluronic acid retains moisture, panthenol soothes, moisturizes, relieves inflammation, promotes regeneration, allantoin softens the upper layer of our skin, heals, removes irritations, promotes regeneration, licorice root whitens, rejuvenates, fights swelling, tea tree oil is an antiseptic and helps with wound healing. As you can see, the ingredients are unique and balanced for gentle exfoliation and maintaining a clean skin. The discs control sebum production, hydrate and nourish. Yes, the discs state that the are a peel and a toner in one, but my skin demands additional care. As we know, Korean skincare allows the use of multiple toners and serums. 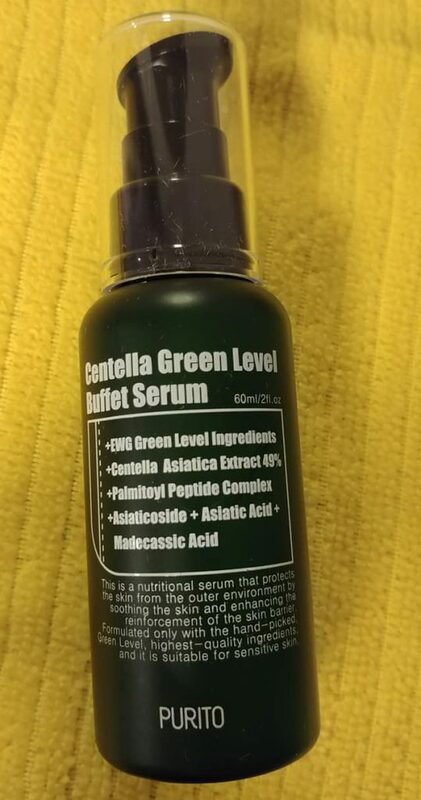 This serum has the consistency of a slightly oily water. I used it for the first time after using a bad sheet mask which caused burning and irritation. The toner completely stopped inflammation and unpleasant sensations. 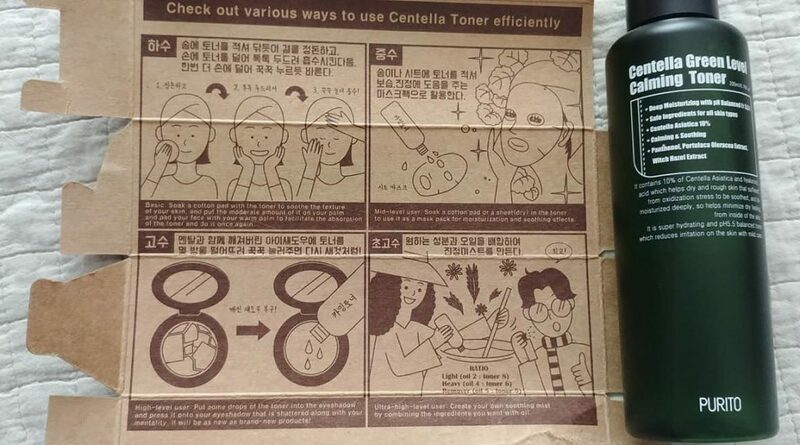 Again, thanks to the magical properties of centella asiatica. I’ve been wanting a toner with witch hazel for a long time, because I know that it’s beneficial for troubled skin and clears pores. I really wanted one by the Mizon brand, but found out in time that it contains pine oils that I’m allergic to and was very upset. What can I say, they don’t lie 🙂 witch hazel really does cleanse. It also strengthens the skin because of tannins. The rose oil became a bonus ingredient for me. As many know, I adore the rose scent. Here, it’s very light and non intrusive. Like the discs, the toner contains hyaluronic acid, panthenol and allantoin. It also contains arginine – an amino acid affecting the defence function of the skin and microcirculation. It’s used in cosmetics that fight couperose and pigmentation. Bergamot oil is antiseptic and helps control sebum secretion, tighten pores. 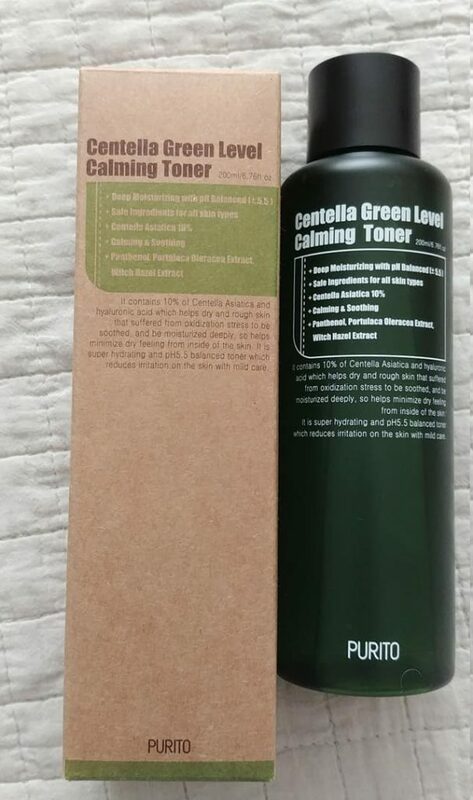 The toner hydrates so well that I got scared of its slightly oily consistency. I thought I would get a major breakout the next day. But no, that didn’t happen. And, most importantly, my face was fresh and smooth in the morning. I have introduced these products one by one because I have allergies and my skin is sensitive. My pores can clog from an even slightly nourishing product. So I can precisely describe the effects of each one of these separately. 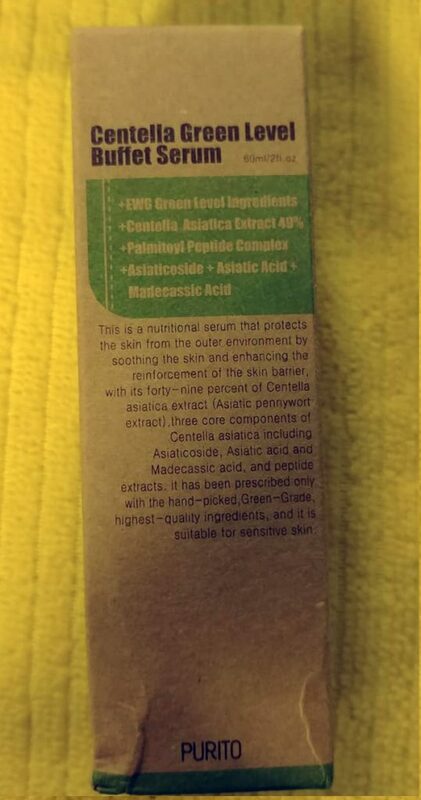 water, centella asiatica extract (10%), butylene glycol, pentylene glycol, dipropylene glycol, 1,2-hexanediol, sodium hyaluronate, panthenol, portulaca oleracea extract, hamamelis virginiana (witch hazel) extract, glycerin, allantoin, trehalose, polyglyceryl-10 laurate, carbomer, polyglyceryl-10 myristate, arginine, ethylhexylglycerin, disodium EDTA, citrus aurantium bergamia (bergamot) fruit oil, pelargonium graveolens flower oil, cananga odorata flower oil, rose flower oil. It’s no secret that a product with the same name by The Ordinary became very popular with the dry skinned ladies. But those of us with combination or oily skin were not so lucky. The Ordinary formula is too oily and clogs my pores. But as this product has shown, you don’t have to have dry skin to be able to use the wonderful properties of anti-aging peptides. The serum contains the same goodies as the toner and discs – centella asiatica, hyaluronic acid and panthenol. Adenosine, niacinamide, ceramides and three types of peptides complete the ingredients list. Adenosine promotes the production of collagen and elastane, prevents the formation of wrinkles. Niacinamide accelerates skin renewal, brightens pigmented spots. The ceramide restores the hydrolipid mantle of the skin. Peptides increase the production of collagen and elastane, smooth wrinkles. The serum has the consistency of a slightly oily gel. Despite the oiliness, it didn’t cause any inflammations, but has nourished the skin, hydrated and smoothed it. I apply this serum to the entire face, including on the eye area under the eye cream. It leaves the sensation of cooling freshness. For me, it’s pure bliss. If I could, I would use the whole line all over my body. But the greed stops me. The cream is light in consistency. After application I feel a light film. 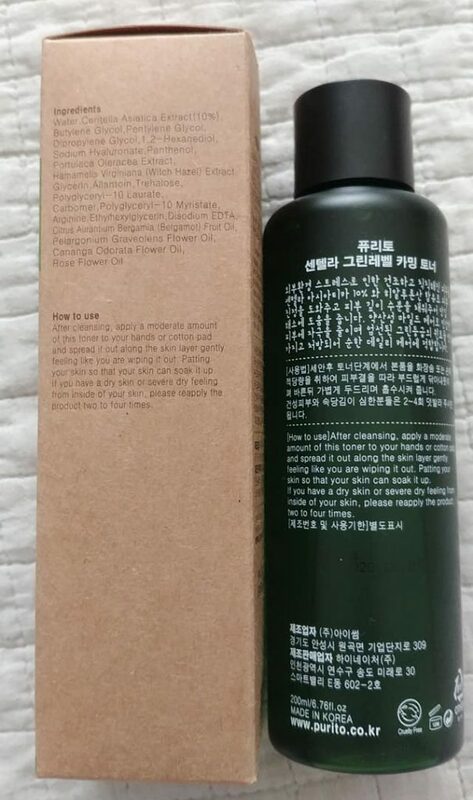 I can compare it to the Innisfree green tea balancing. The sensations are about the same. 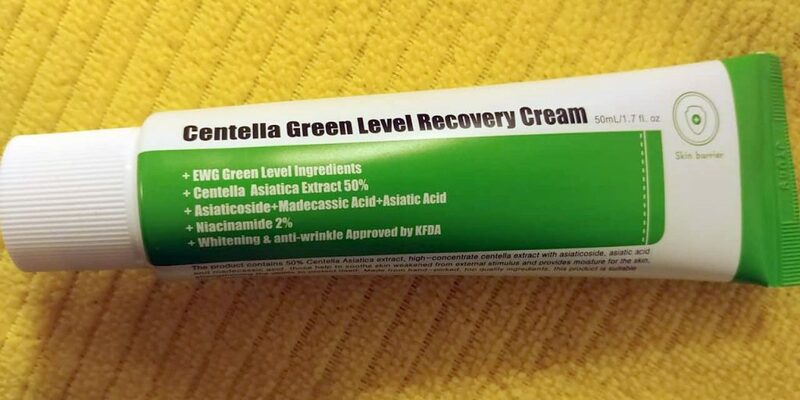 The cream has a much larger percentage of centella asiatica than the discs, toner and serum. 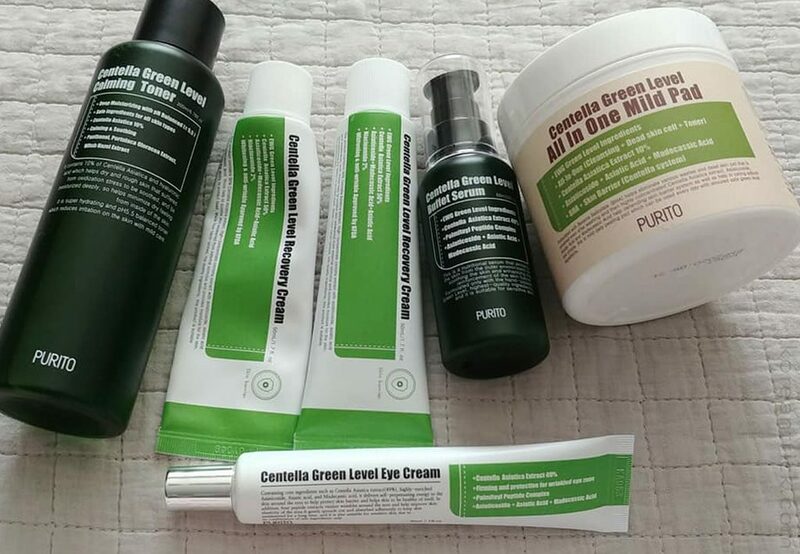 Those products contain 10%, the cream 50%. The cream, just like the toner, contains witch hazel and, like serum, niacinamide and works well for my skin. I’m a niacinamide product lover in general. The cream and serum haves a light lavender scent which promotes soothing and relaxation after application. 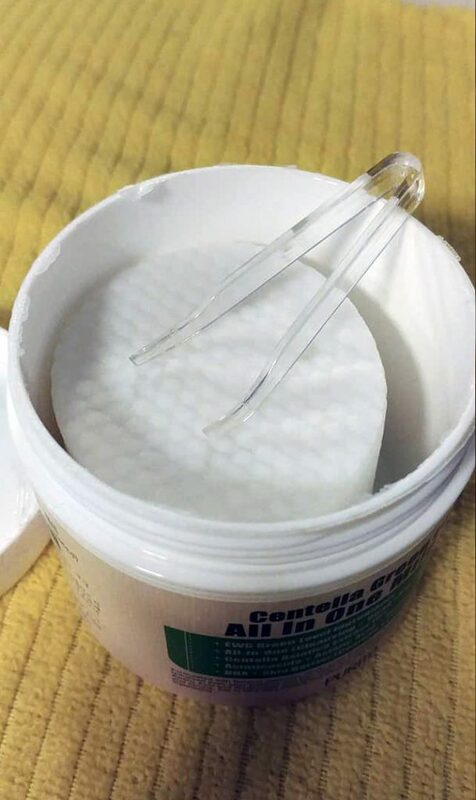 This is a peptide cream. Light consistency. Hydrates and moisturizes well. Goes well under makeup. My hands keep reaching for it. I started to use it at night. Now I use it twice a day. The main ingredient is centella asiatica. Similar with the other products from this line. Plus it contains shea butter and a wider peptide complex. If you ask me about the shortfalls of this line, I will immediately tell you that the main one is the fact that they don’t have patches, masks, body cream and everything else necessary for life. I would have bought it all! P.S. 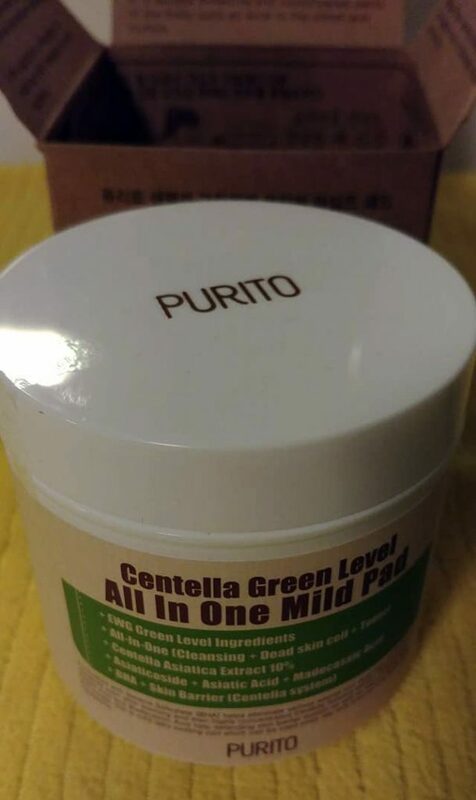 Purito positions itself as using green/safe ingredient according to the EWG. The boxes are made from recycled paper and come with cute comics on the inside. But I won’t write about that 🙂 Look at the pictures.